Neptune ~ The various types of Yarrow were made for Neptunians! The Yarrows promote strong boundaries and turn vulnerability into a combination of sensitivity and strengthened personal aura. The three different colors (white, pink and gold) are differentiated in Yarrowing It All Down and cover environmental sensitivities, relationship boundaries, and buffering the intense vibrations when you’re on stage or in the limelight. Pluto ~ Since an entire article on essences for everyday Pluto issues is linked earlier in this post, I’ll focus on essences not covered there, namely on those that deal literally with birth and death. Alpine Lily helps moms experience motherhood as a physically nurturing and rewarding experience, great for the first time, new parent jitters. Yellow Star Tulip evokes compassionate attunement to one’s child and the ability to sense the baby’s true needs. Forget-Me-Not helps a woman struggling with her decision to have a child and helps her become aware of any karmic connection to an incoming soul. On the home side of the journey, Angel’s Trumpet helps those in the last stages of life prepare for crossing over. Angelica helps the person in transition find protection and benevolence in the spiritual realm. Borage helps those left behind overcome grief and a heavy heart from the impending or ultimate death of a loved one. Chrysanthemum helps us when we’re struggling with our own mortality and enables us to accept the transitory nature of life on Earth. It shifts our awareness from our lower to higher Self. Essences can be purchased online or at a health food store or often at specialty grocery stores like Whole Foods. Call ahead to see which brand(s) they carry. You can find Rescue Remedy on Amazon, and it’s always good to take a ride on your search engine, because plenty of health-oriented sites carry essences, too. I only discovered in the process of writing this article that my personal favorite online vitamin source, VitaCost, sells the full line of Bach and FES remedies. Some of the essences mentioned have several makers, but I will focus on the two most well known brands, Bach and FES (Flower Essence Services). FES also has a line, Healing Herbs, which contains the same flowers as the Bach remedies, simply their brand. N- Z: Oak (B), Plants and Planetary Formulas (D), Rescue Remedy (B), Self-Heal (F), Shooting Star (F), Snapdragon (F), Star of Bethlehem (B), Sunflower (F), Trumpet Vine (F), Vervain (B), Wild Oat (B), Yarrow (F- all forms), Yellow Star Tulip (F), Zinnia (F). If you want to learn more about flower essences, subscribe to Vibration. This former e-zine, now blog, is co-edited by astrologer Donna Cunningham and Dr. Debra Bier of Whole Energy Essences. It’s a virtual bouquet of help and healing. Many of you were introduced to this site through the 1st International Astrology Day Blogathon (see sidebar). Vibration is one of the sites that hosted the large collection of articles across the Internet offering tools for the Cardinal T-Square of Pluto, Uranus, and Saturn. The articles on Vibration focus on flower essences to ease the tension of this outerplanetary line-up. I 've been certified as a flower essence practitioner since 1989 through the Flower Essence Society (FES) in Nevada City, CA. If I never gave essences to a single client, it would have been worth the investment in this training for how flower essences have helped my friends, family, and me. I can’t imagine getting through the current outerplanetary siege without Rescue Remedy and many of my other favorite flower friends. While professional training is a huge asset, you will be surprised how much you can learn to help yourself. You might start with some personal consultations with a flower essence practitioner (see Flower Essence Primer or e-mail me if you’re interested in working together). That’s how I got started, and I quickly made the transition to self-help and helping others. Sometimes you get a bonus in the bouquet. My first flower essence and astrology workshop was with Donna Cunningham circa 1981. She became one of my primary mentors in both tools—add writing—and we have worked together on a number of projects. Wherever the flowers lead you, you will be lighter in spirit. Their synergy with astrological insights is like the florist’s truck arriving at your door during a full moon--beautiful and unexpected! It has always puzzled me that flower essences haven’t caught on more in the US. (They’re better known and much more popular in Europe.) Guess it’s hard to believe that something so simple and easy could actually make such a big difference. 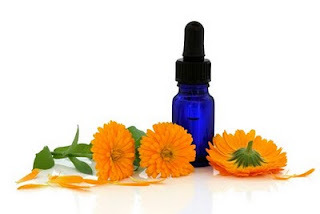 As a flower essence, Marigold celebrates being in the physical body with all its pleasures. Need grounding? Try Marigold. Marigold is made by Whole Energy Essences. Disclaimer: This article does not mean to imply any recommendation or certification of any individuals or companies mentioned. It is provided purely for informational purposes. Please make your own determination about the quality of the services and products offered. This article and the others referenced are not meant to constitute advice, nor are they meant to replace medical or psychological treatment. Thanks, Susannah! It was fun to do, and I hope it can be a flower essence shopping list for transits and natal issues ... but all means not all inclusive! Always lovely to hear from you. I'm doing well, thanks. I have myself just discovered flowere remedies, i think they do help you to deal with whatever it is that you are dealing with at the moment.. although not easy to spot the exact effect!